Description: The Snake Braid is sometimes called the Snake Weave. It is a flat type of braid, which makes it suitable for jewelry. It's easy to make and a good choice for kid's and beginner's projects. 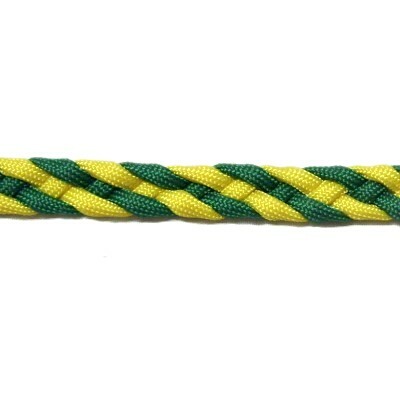 This braid is sometimes tied with one cord, crossing the working ends around a loop. In this case, two cords were used to make it easier to practice. I recommend you use two contrasting colors, which will show the striped pattern more clearly. Since this decorative knot can be used for jewelry and belts, you will need to form a loop for a clasp, and the method shown in step 1 is just one of the many options. Feel free to experiment with other techniques. You can start the design in the center of the cords and work in both directions, if you project works out better that way. Be sure to use a project board and pins while learning this style of braiding. 2018 Update: Text and images were changed. Contact me if you need the original pattern. Preparation: You need two cords, at least 36 inches long, to practice the Snake Braid. 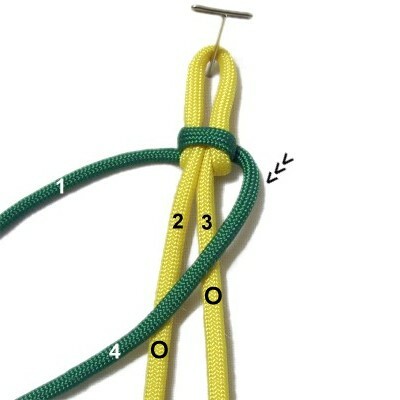 When using Paracord, melt the tips of the cords to seal the inner fibers. See Cord Preparation for details. 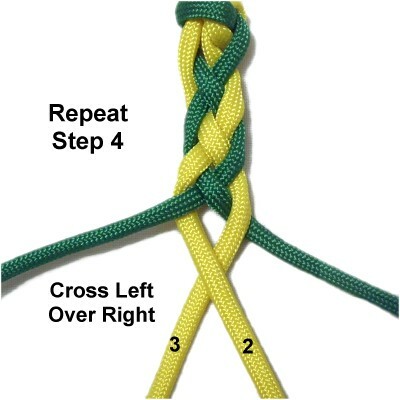 Step 1: Fold one cord in half and secure it at the center (A). 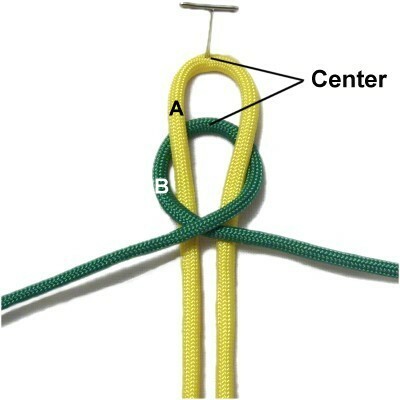 Fold the second cord (B) and place it under the first one, so the centers line up. You can secure it if you wish. 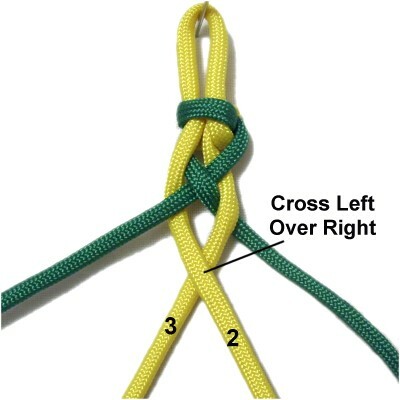 Cross the two halves of cord B right over left. 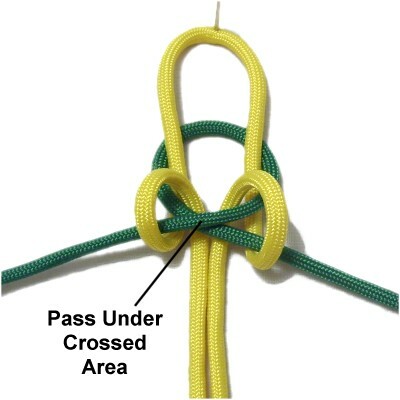 Move both halves of cord A backward, then pass them under the crossed area of cord B. Pull both halves of each cord to tighten, after adjusting the size of the loop at the top (cord A). Turn the loop design upside down and secure it to your board (next image). Step 2: Mentally label the four parts as if they were four separate cords. Move cord 4 to the left diagonally, passing over cords 2 and 3. Step 3: Move cord 1 to the right diagonally, passing under cord 2, over cord 4, and under cord 3. Tighten by pulling on cords 1 and 4 while holding cords 2 and 3 steady. Step 4: Cross cords 2 and 3 left over right. 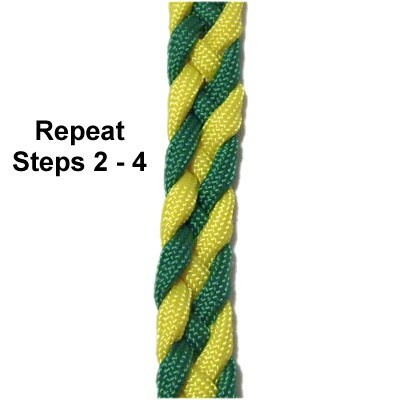 You should tighten the Snake Braid as you progress, so do that now. The two crossed areas should rest against each other. Step 5: Mentally re-number the cords where they rest now. Step 6: Repeat step 3. Step 7: Repeat step 4. 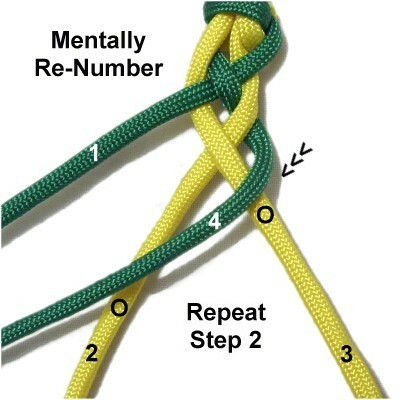 Step 8: Repeat steps 2 - 4 several times, mentally re-numbering before you repeat step 2. Stop when the Snake Braid is finished size you wish to make. 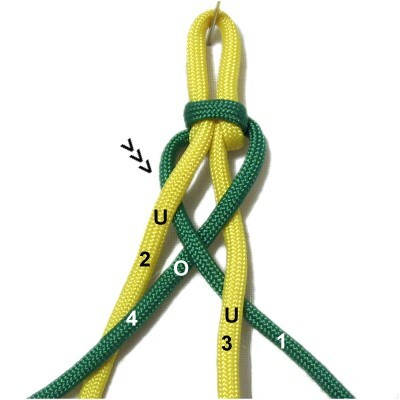 Keep in mind you need to tie one more knot to secure the braid. 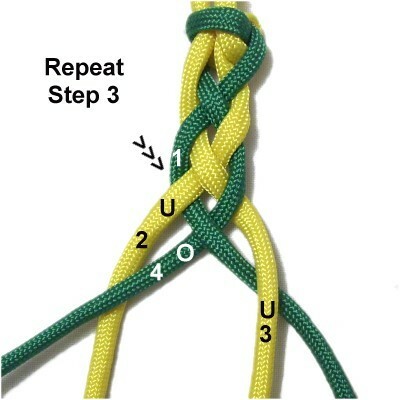 Step 9: Tie a finishing knot to secure the braid. 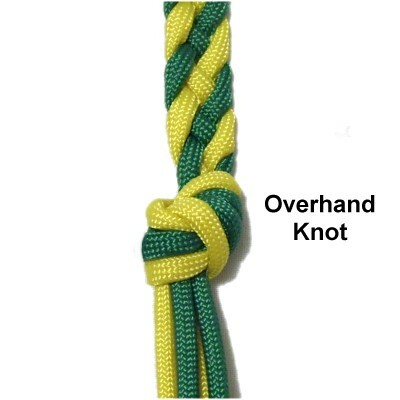 When practicing, an Overhand knot is a good choice, since you can tie it with all four cords. The best way to form a clasp is to finish off two cords in the back of the braid, then tie a button knot with the remaining two. Have any comments about the Snake Braid? Contact Me.